​​Alpacas originated in the Andean mountains of Peru, Bolivia, and Chile. They are raised for their fur, called fiber or fleece, in the same way that sheep and goats and other fleece animals are raised. Alpaca fleece is shorn off the animals generally once a year and usually in the spring, and their fleece regrows until the next shearing. Alpacas have been domesticated for about 5,000 years. They played an integral part in the Inca civilization, who dwelled on the high Andean plateau. When Spanish conquistadors invaded Peru and Chile, killing Indians and their animals alike, the alpaca sought refuge in the high elevations. They developed the ability to live on low protein vegetation and only the strongest survived. The result is today's alpaca, a very hardy and adaptable animal. Alpaca fleece is really, really nice! If you haven't felt baby alpaca yarn ("baby" refers to the fineness of the fibers rather than the age of the alpaca) or an alpaca blanket, then you should. Their cashmere-like fleece was used to produce clothing for Inca royalty. Alpaca farming is becoming very popular in the US in part because the end product, alpaca fleece, creates truly delightful and wonderful yarn in 22 natural colors. Alpacas have an excitement and mystique that have really made them popular in the US. They are elegant and delightful to watch grazing in the fields. Raising them is fairly undemanding once you have your farm set up and your maintenance procedures in place. All these benefits, added to the amazing profit potential (the US market has been steadily profitable since the 1980's when they first began importations), make them a wonderful venture. Alpacas are from the Camelid family and are related to the wild vicunas and llamas. Llamas are quite a bit larger and have a banana shape to their ears. Llama fleece can have a lot more guard hair (coarser fibers) throughout their coat than alpacas. Alpacas have been bred in South America for hundreds of years to refine their fleece to make the guard hairs finer and fewer until the whole blanket can be used without having to process out the coarser fibers. There are two types or breeds of alpaca: the Huacaya and the Suri. The huacaya's fleece has a wavy quality, or crimp, that enhances its use in spinning. The suri has a lustrous fine fiber that has no crimp, but grows in very defined pencil-like locks. Because of their small size and easy care, alpacas are ideal animals to raise on small acreage. Six to eight alpacas may be stocked comfortably on a single acre. If there is a problem to be faced in caring for alpacas, it is in keeping them cool during the summer months. Breeders rely on fans, readily available water and regular shearing to help their alpacas tolerate the heat. The gestation is approximately 11.5 months (nearly 1 year) and a single baby alpaca (called a "cria") is born at the end of this time. The beginning age for breeding varies from breeder to breeder and from alpaca to alpaca depending on the speed of their development. Many breeders start breeding at 18 months to two years for females and from two to three years for males. Worming and vaccination programs vary in different parts of the country. You will want to consult your local camelid veterinarian for their recommendations and give regular treatments for worms and regular vaccines to the whole herd. Alpacas eat grain and hay that can be purchased through farm feed stores and they graze on pasture if it is available to them. Some farms keep their alpacas in barns at night and others keep theirs on the pasture year round with shelters. Alpacas are herd animals, so it would not be right to keep just one. You want at least two, prefarably three, to keep each other company. 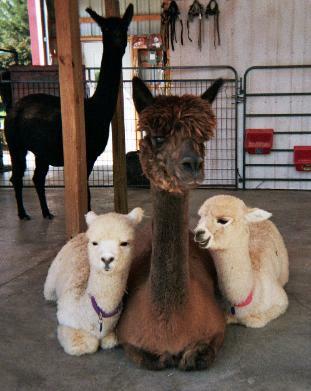 (whether or not is has had a healthy cria or sired a healthy cria), whether it has won awards at shows or its parents have won awards at shows, the color and fineness of its fleece, its conformation (the size and shape of the body parts in relation to one another and how well it "conforms" to the desired alapca size, shape and bone structure), market value and other factors. In 2004, Dom Lucilio, a proven stud huacaya male sold at auction for $425,000! 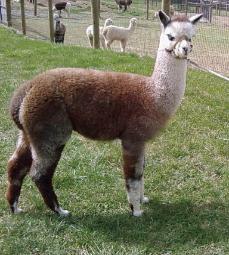 We have a granddaughter of Dom Lucilio, Miss Black Magic, who will give birth to her first cria in May 2010. When she delivers a healthy cria, her value will rise considerably. In March of 2010, Snowmass Matrix sold for a whopping $675,000. Did someone say the economy had gone south? Future controlled importation of quality alpacas will further broaden the genetic diversity in this country. Our goals of developing a national herd with superior conformation and fleece production will enable the United States to create and supply its own specialty alpaca fiber market. We welcome visitors to our farm year round. 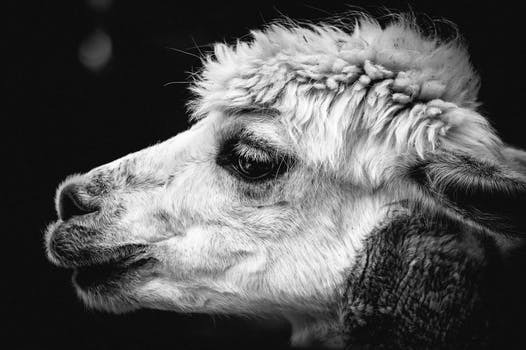 The marketing that goes into every aspect of the business is drawing new breeders, weavers, spinners, clothiers into the world of alpacas every day. Contact us to learn more! There have been articles in the Wall Street Journal, stories on CNBC, Nightline, and major and local news agencies giving the alpaca industry the nod—yes, even in this economy! The alpaca industry has the luxury of being an industry that has not matured yet, which makes it an excellent investment opportunity for new breeders who are entering the market because of the potential, not to mention the tax incentives. Sometimes a bad economy is an investor’s good fortune. The economy is going to turn around and if you make wise choices, you are in a better position when the turn does come…and it will! Use this economy to your advantage and purchase a foundation herd while you can get more for your dollar. Purchase the best possible breeding for your females, buy the herd sire you want for your farm and/or the female that adds those before “out of reach” bloodlines. It is tempting not to spend any money on a business at this time, but what other time are you going to get such good "buys for your buck"? Focus on the future and we will stay competitive and prosper. All of this will one day lead to a mature industry of fleece and American-made alpaca products that will help keep this nation strong and self-sufficient.